The first words on the Congress manifesto — spoken by Randeep Singh Surjewala, who said “this will write a new history in India" — were all about raising the hype surrounding the event. Speaker after speaker, including party chief Rahul Gandhi propagated the "historic" theme. From the Congress perspective it indeed was a historic event: Sonia and Rahul were at the dais and Priyanka, recently appointed general secretary, was seated in the front row of the audience, along with other distinguished Congress leaders. The Congress' Nyuntam Aay Yojana (NYAY) scheme was also referred to as historic. 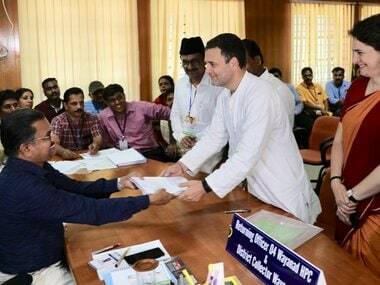 The Congress believes its vow to pay Rs 72,000 to five crore poor families is "game changing". Rahul even came out with a new slogan: “Garibi par waar, 72 hazar”. 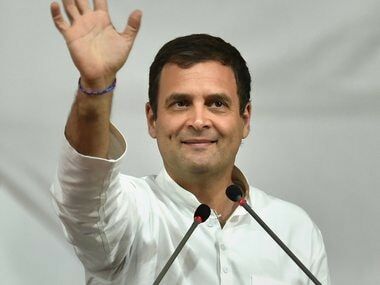 Extending his hand, the Congress president said the manifesto — like his fingers — had five prominent items and asserted that it would set the narrative for the 2019 polls. However, within hours of the launch, the BJP called on its vast network of workers and sympathisers to take the narrative to a different pitch. The BJP pushed the theme that the Congress manifesto was “pro-terrorist” and “pro-separatist”, the promises made were “dangerous” to country’s integrity, it was “agenda for Balkanisation”, it was “anti-Indian Army and anti-security forces”. The top guns began firing back at the Congress, with Finance Minister Arun Jaitley holding a media briefing at party headquarters in New Delhi on Tuesday, Prime Minister Narendra Modi talking about it in series of his public rallies in Arunachal Pradesh, Bihar and West Bengal on Tuesday and Wednesday, BJP president Amit Shah attacking Congress in his public rallies in other parts of the country, Defence Minister Nirmala Sitharaman holding a press briefing on Wednesday at party headquarters and claiming that the Congress manifesto would "demoralise" the armed forces fighting day in and day out in Jammu and Kashmir. The BJP said that the promises made by the Congress (amendments in AFSA and repeal of sedition law) if implemented, would favour terrorists and secessionists, encourage subversive activities and leave security forces in a most vulnerable situation by tying their hands. The BJP said the Congress was also for unconditional talks with separatists, who are now facing brunt of law enforcement agencies. Other BJP leaders, ministers, chief ministers, star campaigners, office bearers, candidates across the country and foot soldiers also slammed the manifesto. In the past 24 hours, the BJP had some success setting the counter-narrative. The BJP's pitch was so loud that Congress’ chatter about NYAY, their supposed ticket to grab power at the Centre, was drowned out. The Congress’ poll promise “bail a norm and jail an exception” was also dubbed a security issue. The BJP said the manifesto showed that the Congress intended to handle with kid gloves terrorists, secessionists, scam artists, and criminals. They also stated that Rahul, Sonia and other several senior Congress leaders were out on bail. 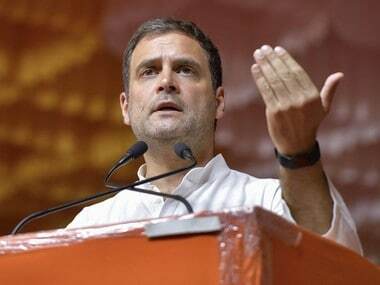 The Congress' problem was further compounded by the fact that its top leadership has been demanding “proof” of airstrike and surgical strikes conducted by Indian Air Force and Indian Army on terror camps deep inside Pakistani territory in retaliation for Pakistan-sponsored terror strikes in Pulwama and Pathankot. The Congress is still not satisfied with the information provided by the government and their questioning the veracity of the airstrike has made headlines in Pakistan. The BJP also made much of Rahul's previous appearance at JNU — a day after the arrest of Kanhaiya Kumar in a sedition case — to express his solidarity with left-wing students and teachers to claim Rahul was supportive of the radical Left and secessionists. 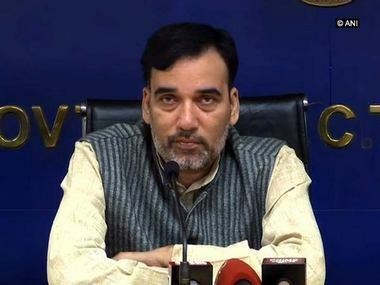 The BJP also said that while the Congress manifesto focussed on Armed Forces Special Powers Act (AFSPA), repeal of sedition law, curbing powers of the district administration to suspend the use of social media (particularly WhatsApp) when stone-pelters target security forces, the Grand Old Party remained completely silent on the rights and rehabilitation of the Kashmiri Pandits, and the status of Central Paramilitary Forces killed by terrorists, something it had been targetting the Modi government over post the Pulwama terror strike. At his rallies, Modi, in his characteristic style, spoke at length about how the Congress was sympathetic to "anti-national" forces. “The Congress has made a scheme for violence by secessionists, for those who abuse country, for those who burn tricolour, for those who don’t say jai Hind, for those who chant Bharat tere tukde hoonge, for those who deface Ambedkar’s statue. The Congress has sympathy for such people. The chowkidar (Modi) is standing with brave sons of soil… the Congress has become ideologically bankrupt”. Jaitley charged that the Congress, under its present day leadership, was siding with Maoists and separatists. While BJP put all its might to push out a counter-narrative, the Congress was content with a press conference by P Chidambaram. 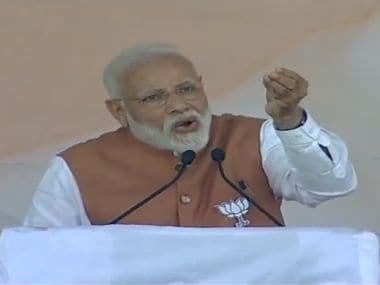 The reason why BJP succeeded in hijacking the Congress narrative was not because the Grand Old party erred in listing out issues on national security, but because the BJP launched a fierce attack from different parts of the country through the powerful oratory of Modi and other senior leaders. In contrast, the Congress was content to languish in the air-conditioned AICC headquarters.